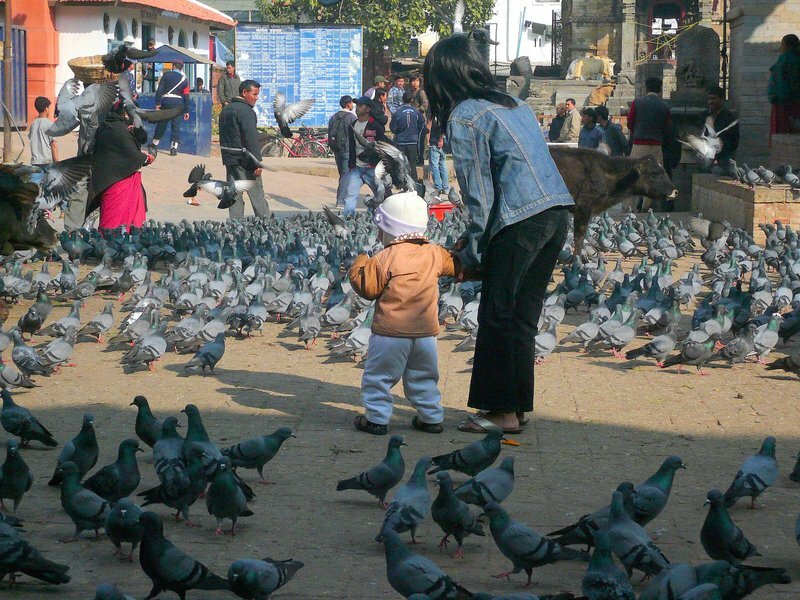 India (6): the Ganges to Kathmandu - Salut! Cheating a bit, I suppose. But since I think this should be the last posting about my recent visit to India, I cannot think of a better place to end than at the top - even if Everest is actually on the border of neighbouring Nepal and Tibet. 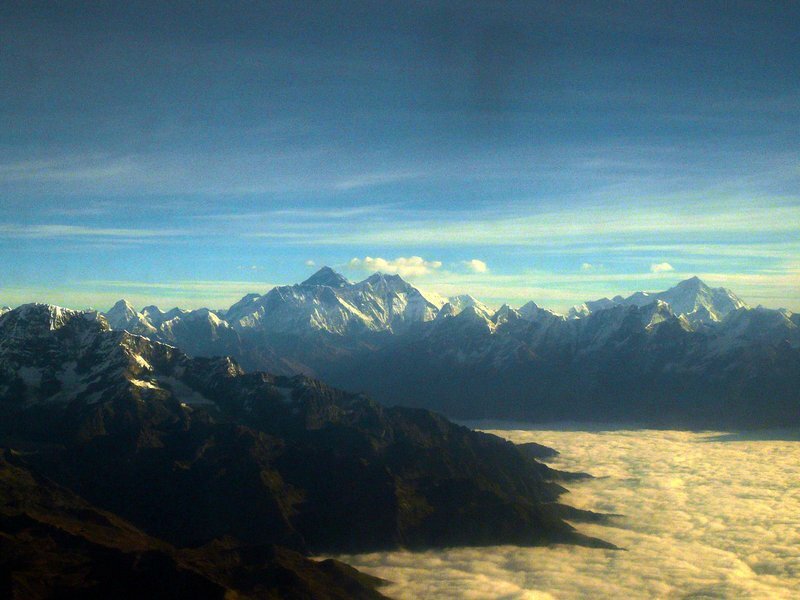 Visiting Kathamandu without hiking boots or climbing gear, the must-do activity has to be taking one of the early morning flights to view the magnificent Himalayas. Mine, in a 16-seater Buddha Air plane, everyone beside a window with the bonus of a few seconds in the cockpit, was worth every penny of the £75 ticket. Taken through an aircraft window, any photograph I produce of Everest is going to be vastly inferior to what you'd find on the cheapest postcard. But I had to post one picture of my own and this is the best I can do. It was a fitting way to finish off a tiring but completely absorbing holiday. 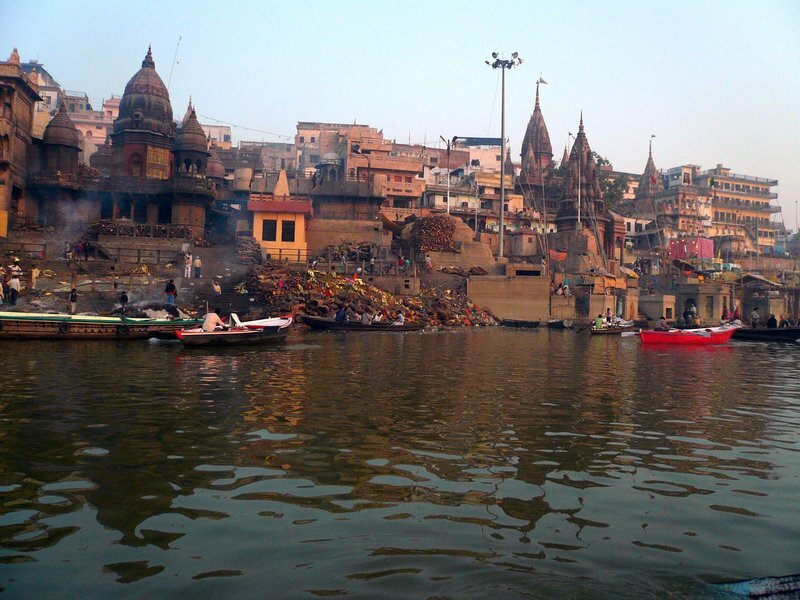 Last stop before Nepal had been Varanasi, with striking sorties in rowing boats on to the Ganges. By night, people were cremating their dead in keeping with ancient tradition on the ghats lining the river. Next morning they were back, or perhaps hadn't been away in many cases, bathing in the murky waters and even, on occasion, gulping down a few drops. 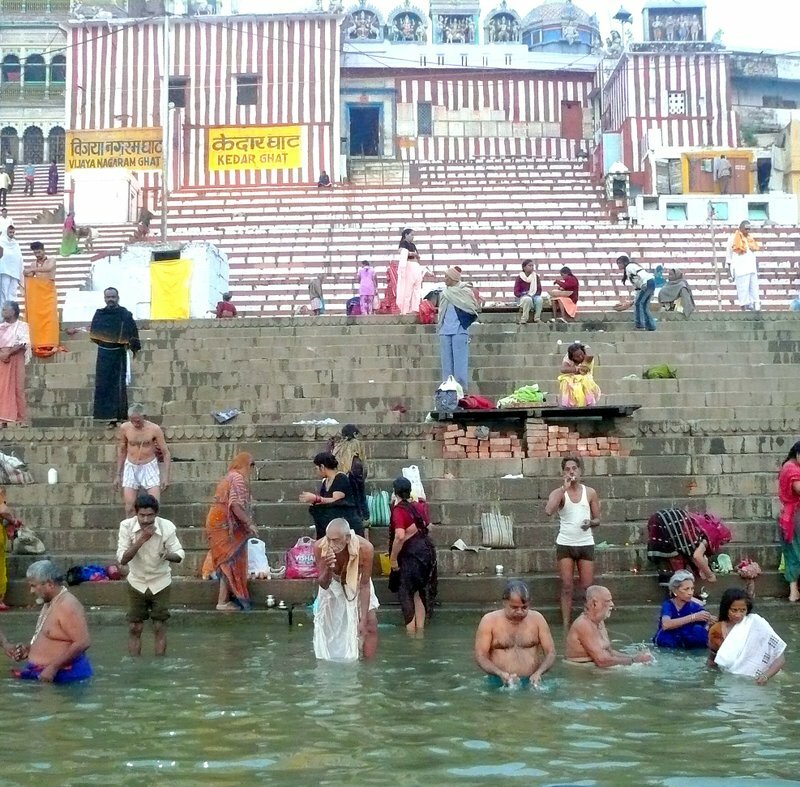 Our guide said he'd have no problem taking a dip, but would be as ill as any of us if he treated the Ganges as drinkable, holy though it may be. 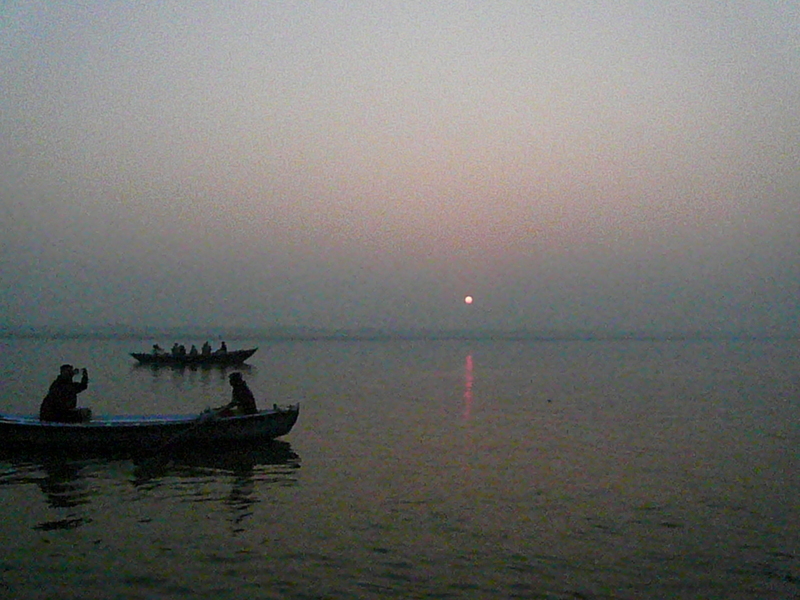 It was easy to see why Varanasi has always proved a powerful magnet for people in search of spiritual inspiration. Long after George Harrison's sojourn, you see plenty of 2007 equivalents of the hippies and mystics of the late 1960s and 1970s. So that was our farewell to India. What, apart from Everest, was there to see in Nepal? Evidence of social turmoil for a start. If my conversations in Kathmandu gave an accurate reading of the political temperature, you may be reminding yourselves a few months from now that I detected the whiff of revolution in the air. "One way or the other, the monarchy will go," one well-educated, middle class resident assured me. "And it will happen well within a year." The palace massacre of 2001, when Crown Prince Dipendra is assumed to have killed 10 people including his parents, the well liked King Birendra and Queen Aishwarya, left a thin choice for succession to the throne. Dipendra technically reigned for a few days but, having also shot himself according to the official version, died after three days in a coma. His uncle, Gyanendra, became monarch, would settle for being merely unpopular. In fact he is despised, at any rate by those I spoke to on such matters. Already reduced to ceremonial figurehead, he stands a good chance of being forced out and remembered as the last king of Nepal. But revolution wasn't the only thing in the air. 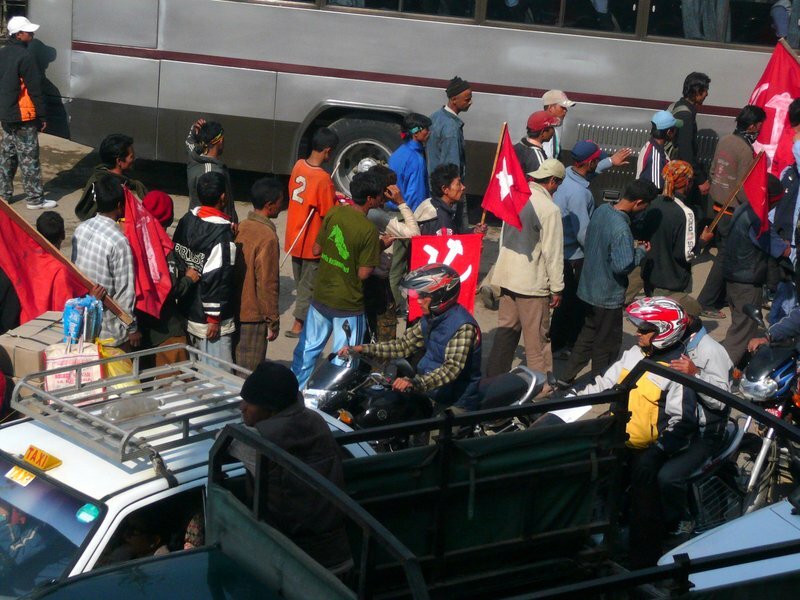 We arrived in Kathmandu as rubbish was piling in the streets because of a strike. 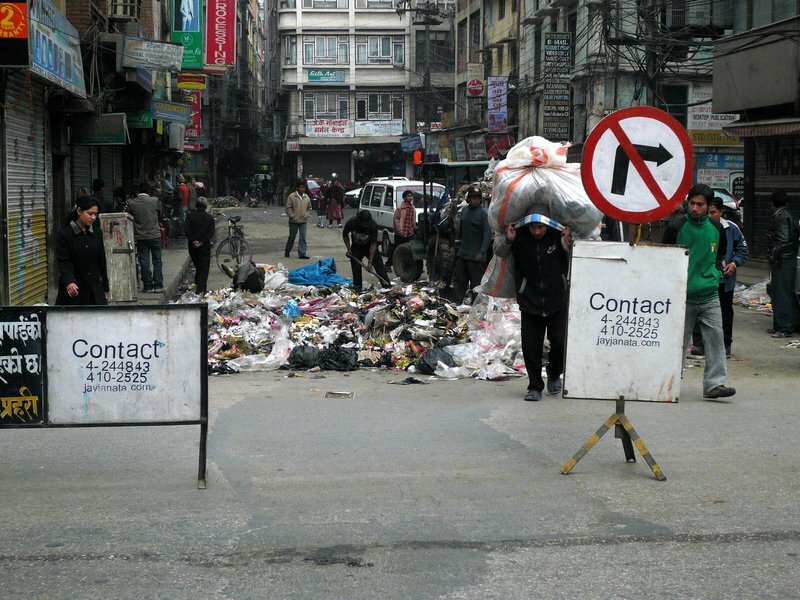 It was filthy and smelly, though not quite as much as in parts of India without a refuse strike. If it was sometimes advisable to hold the nose, Kathamandu and the town of Bhaktapur - "a.k.a back to poor" said a disgruntled Nepalese leftie - contained some formidable sights and yes, as my reader "Tenbon" will be delighted to have confirmed, wonderful food at the stunning Dwarikas Hotel. Reading the Himalayan Times on the day of my departure for London, I expected the final experience of Nepal to be one of marathon delays and endless battles with grasping security staff and dodgy immigration men at the airport. "Corruption in Nepal may be bad, but Kathmandu airport is where it is rampant " the paper warned us in a feature on the world's worst airports (Charles de Gaulle, I am unsurprised to report, was in there too, ranked alongside Baghdad, Dakar, New Delhi and Mineralnye Vody near the Russian/Chechen border). In case anyone felt the Times was having trouble making its mind up, the reporter added: "It's a den of thieves." But our queues lasted a few minutes, no one tried to fleece us (except for the men who pounce with trolleys as you arrive at the terminal building) and no guard demanded bribes before allowing hand luggage through. 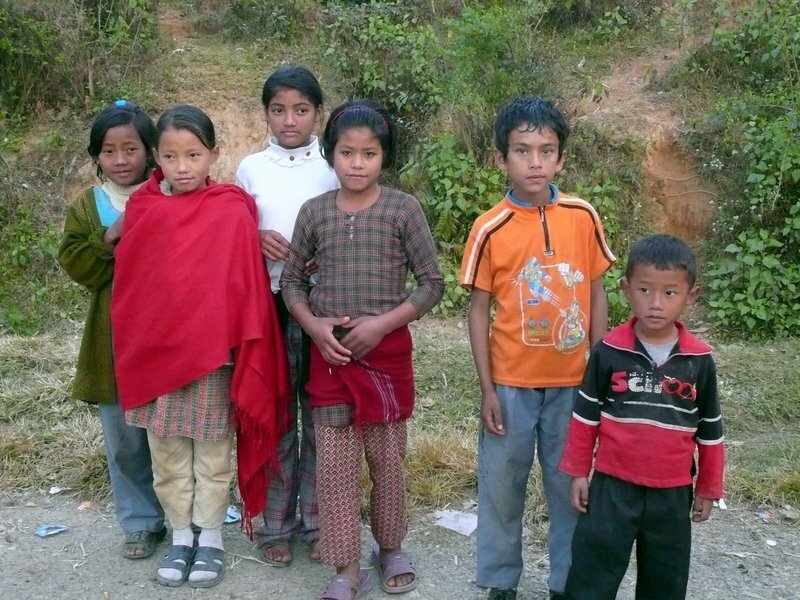 So I took home instead memories of the mountains, the temples, the vibrant if rubbish-strewn streets.......and these delightful waifs who used every trick known to beggars to extract money, sweets and pens as they followed us during the briefest of walks in the Himalayan foothills. They were happy to pose, but a few more smiles on faces would have told the fuller story. They'd just made a killing from overfed and ever so slightly guilty westerners.